Researchers at Agro-Industrial Research Center at Jorge Tadeo Lozano University in Colombia are studying what conditions foster the growth of a fungus that causes downy mildew on roses. Flowers are now a large percentage of Colombia’s exports, and researchers are hoping to learn how to stop the fungus without using harmful chemicals. 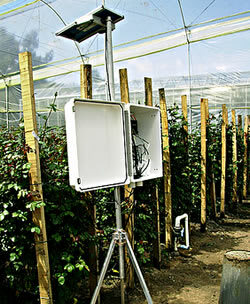 To do this they are using Apogee infrared radiometers and Campbell Scientific dataloggers to monitor the roses. The university hopes to find a natural way to prevent the fungus that can be used throughout the crops in Colombia.